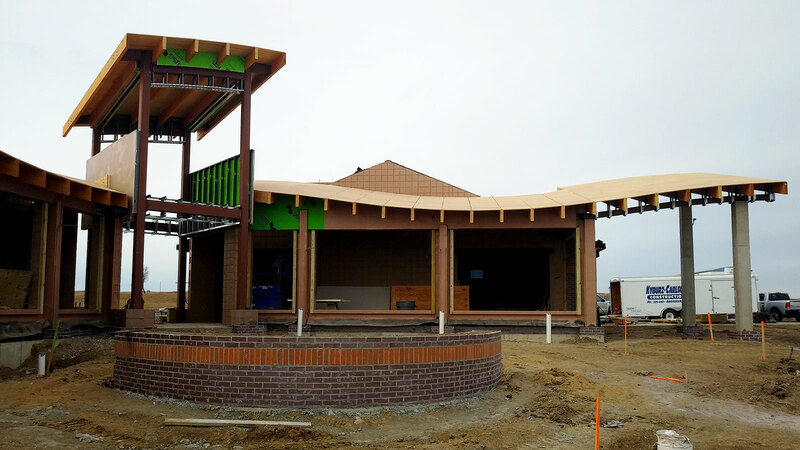 Expansion and renovation of existing interstate rest area to create a full welcome-center experience for travelers. The TSP team is collaborating with multiple state agencies to modernize and expand two rest areas―one along each of the interstate highways that run through South Dakota. The work is part of the Department of Transportation’s overall initiative to upgrade its facilities while promoting the state’s attractions with a focus on tourism. The Whetstone Valley was formed from an ancient lake that now consists of rolling hills. The Wilmot rest area on Interstate 29 sits atop one such hill, overlooking the others. Constructed in 1993, the existing structure has aged well and been well-maintained. This building will receive new lobby finishes as well as new fixtures and finishes in toilet rooms. A family toilet will be added for traveler convenience. The design team oriented the addition to emphasize the sweeping views of the valley to the south and east. The addition’s primary function is to offer a Welcome Center and exhibit space, with interpretive installations to be designed by a specialty consultant. The valley’s landscape inspired the form given to the roof of the connecting link. The site’s existing entry remains unchanged in its winding path with multiple forks. The entry height is taller to provide visitors a wayfinding element as they enter the site. The glass tower is internally illuminated to maintain that wayfinding at night.